Since childhood I’ve been obsessed by two automobile models–Porsche’s 911 and BMW’s 5 Series. In early 1996 my wife and I visited Perillo BMW in downtown Chicago where we got a surprise. It was 1996 and there was no ’96 year model 5 series being introduced. In 1997 there would be a year model but BMW’s 5 series, as we knew it, was about to change. With the introduction of the E39, gone would be the classic round headlights, the airplane cockpit like climate controls, and other elements of charm that we loved. With a handful of discounted 1995 E34’s still on the lot, shortly thereafter, we returned and bought a manual 5 speed 525i. We still have this car as of the writing of this page. Though discounted, purchasing a 5 series in your 20’s is a stretch. What I really wanted was a coveted 1993 M5 but that wasn’t realistic. Still, I was inspired by the M5. 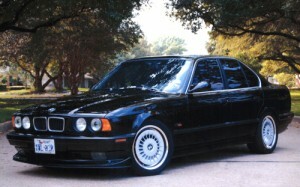 As time went on, I began to customize our 525i including upgrading the rims to 17″ turbines from a 1991 M5. Through the years I kept the car well maintained. In 2005 it won the 5 Series ’89-’95 category in Bavarian Auto’s photo contest. Sadly, in 2007 the transmission began to develop a few problems and we garaged our E34 with the intention of someday investing in the needed repairs. Why garage my 525i? Wasn’t it my passion? This E34 was my passion but there were two reasons for garaging it. First, the economy was becoming terrible and my wife and I couldn’t justify spending the money on repairs at that time. The second reason was in 2001 we purchased a 1995 911 (993) and had diverted some of our time to it. Fast forward to 2014 and times had changed economically. My wife and I began to talk about getting the 525i on the road again. I met a very good mechanic who had the knowledge and the time to rebuild the 525i’s manual transmission. Thus, I pulled the trigger on having the car towed to his shop. As soon as it got there, I got a call from another mechanic whom I’d known for years. 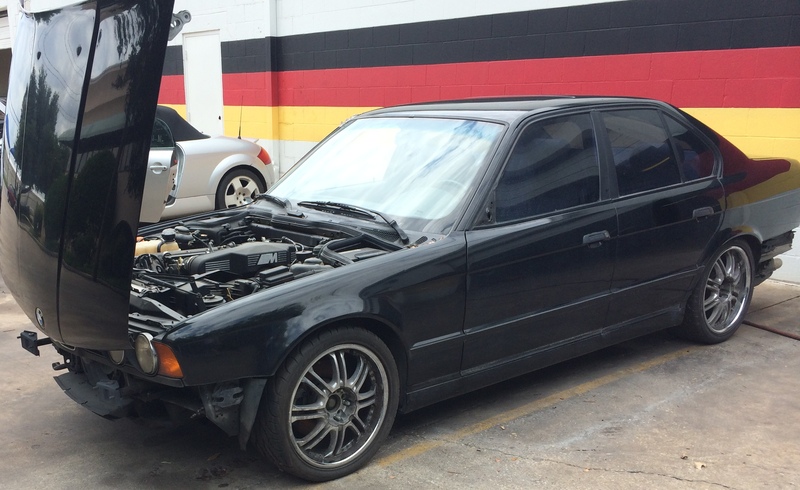 He had a customer with a 1993 M5 that had been the target of vandals and thieves. He was the original owner and the car had a solid 10 years of mechanical work including a valve job. When an M5 gets ransacked, insurance money doesn’t really help as many of the parts are simply NLA (no longer available). After not much luck in finding replacement parts and leaving the car parked for over a year, the owner decided he was going to have to part it. This is how I was given the opportunity to own an E34 M5. After a long conversation with my wife, we decided to purchase the car from him and use our beloved 525i the donor car for several damaged and stolen parts. I was fortunate in that I had two sets of M5 wheels in my possession which was at the top of the list of high dollar items the thieves took. It was a great opportunity and a big decision for us. The restoration of our newly purchased 1993 E34 M5 is good story. This site is dedicated to documenting the story. I hope that other M5 enthusiasts can learn from my journey. I hope it inspires others to preserve the few remaining E34 M5’s we have on this planet. This site also captures the last known details of our 525i as it will be parted after the M5 restoration project is complete. Please note, I have turned comments off on this site as I do not want to divert an dialogue from sites like the M5 Board. The members of the M5 Board in particular have been very helpful to me during this restoration. If you have questions for me, post them there or send a private message to dericksc . It is important that we support the M5 community and I am committed to doing so. Last, this site does not contain any advertising scripts. I self fund this website. Thus, if I link out to a product or commercial site that I used, consider it a true endorsement with no monetary consideration.